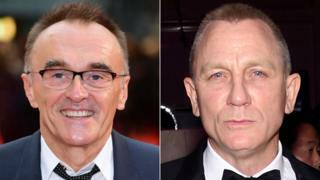 Danny Boyle has revealed he is working with Trainspotting writer John Hodge on a script for the next James Bond film. If made it will reunite the Oscar-winning director with 007 star Daniel Craig, with whom he worked on a short film made for the 2012 London Olympics. Boyle said this week he and Hodge had "got an idea" and were "working on a script". "It all depends on how it turns out," the director told Metro US. Bond producers Eon have been contacted by the BBC but have yet to comment. Boyle and Hodge's agents have also been contacted. Eon announced last year that the 25th official instalment in the James Bond series would be released in November 2019. Craig later confirmed he would be returning to make his fifth Bond, having previously starred in Casino Royale, Quantum of Solace, Skyfall and Spectre. When the release date was announced, Eon said the script for the new film would be written by regular Bond screenwriters Neal Purvis and Robert Wade. According to the Daily Mail's Baz Bamigboye, however, it is possible that script "now won't get made". It is not uncommon for Bond producers Barbara Broccoli and Michael G Wilson to commission scripts that are not eventually produced. Peter Morgan, of The Queen and Frost/Nixon fame, reportedly worked with Purvis and Wade on a film treatment entitled Once Upon a Spy. That film was never made, though one of its key plot points - the death of Bond's superior M - did end up forming the climax to 2012's Skyfall. The Bond series also has a history of bringing in writers to work on existing scripts. Paul Haggis worked on 2006's Casino Royale, while director Sam Mendes enlisted playwright Jez Butterworth to work on Spectre. Boyle's other current projects include All You Need is Love, a Richard Curtis-scripted film that revolves around the music of The Beatles. According to the Mail, it is hoped Boyle can begin shooting 'Bond 25' at the end of the year once All You Need is Love is completed. But what is the "idea" behind Boyle and Hodge's film? "It would be foolish of me to give any of it away," said Boyle this week. With nothing whatsoever to go on beyond a knowledge of Bond's history, here are a few light-hearted suggestions. Bond becomes M. After more than 50 years as a Double-0, it's high time 007 got a promotion. What if the new film saw him taking over from Ralph Fiennes in the MI6 hotseat? Bond gets hitched. James hasn't walked down the aisle since 1969's On Her Majesty's Secret Service and it didn't end well. Could the new film see him dare to tie the knot again, as Page Six claimed last year?